Rob was always the guy in class scribbling constantly on any surface he could find. His grades reflected this obsession. Luckily, he is now able to make some bucks with this talent. For many years Rob was a sought after make-up artist, and this was his creative outlet. He is thrilled that now his artwork is more permanent. Rob considers himself a pop artist and has been influenced by the art of Keith Harring and pulls from anything that catches his eye. Comic books and graffiti art seem to constantly feed his imagination. He tends to lean to more offbeat styles and vibrant color schemes. 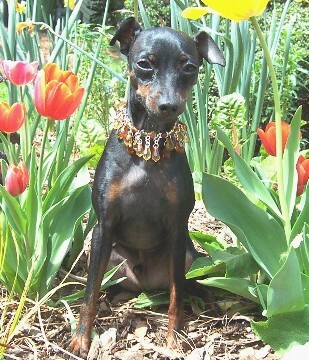 Wild Dogs Pet Portraits all started with a portrait of Rob's min pin Roscoe. Everyone loved "Roscoe" and wanted their pooch painted. Rob is becoming well known in Atlanta for his fun style. His work was featured in the March 2004 Doggie issue of Atlanta Magazine. Everyone wants their pooch to be a WILD DOG! Rob doesn't just do dogs. Visit Eclectic Electric in Virginia Highlands, a funky lighting art gallery to see some on his whimsical funny people paintings. They will certainly lend you a smile! You can also contact Rob directly to purchase some funky faces! Find a pet in need of adoption at the Atlanta Humane Society. Intown Animal Hospital, located in Atlanta, provides many services beyond routine and preventative health care for you pets. Visit Kira's Care Pet Sitting for personalized pet care and lots of love. Visit Pet Fixer to find out more about their mobile veterinary services and spa!